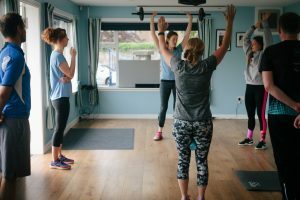 Inside Out PT provides Group Personal Training packages for a vibrant community of members that train together and support one another on their journey to better health. Join the Inside Out PT Community! Group Personal Training is a series of exciting fitness sessions with a maximum of six people in each class. Expert coaches tailor exercises to your needs ensuring you get results at a fraction of the cost of 1:1 personal training. 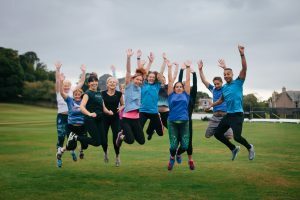 Whatever your fitness level, you will look forward to exercise and feel inspired and supported when training alongside other members of the Inside Out Community. Our group PT sessions take place at our light and airy studio and grounds of the Carlton Cricket Club in The Grange in Edinburgh. There is plenty of low cost parking available and the beautiful view of Arthur’s Seat makes it a truly inspiring place to achieve your well-being goals. Be inspired by other members to push yourself further than ever before. Train twice a week for less than the price of a one to one personal training session. Get guidance from our expert coaches who will ensure you are exercising correctly. Meet new friends, share tips and advice, take part in a team events. The varied fitness challenges will keep you stimulated and eager to attend. We are looking for both women and men aged in their 30’s to 50’s that are committed to improving their health and wellbeing and are willing to invest in a quality programme that will help them get results alongside their existing commitments of a busy lifestyle. Inside Out PT is proud to be supporting 3 charities in 2018/19. Money raised from events and sponsorship will be donated to these charities: The UK Sepsis Trust, St Columbas Hospice, Maggie’s Edinburgh.